“NEW JERSEY GUIDO KILLED IN SHARK ATTACK” Could that be a headline this summer? Home → Damien Zone → “NEW JERSEY GUIDO KILLED IN SHARK ATTACK” Could that be a headline this summer? SEASIDE HEIGHTS, THAT DUMP ON THE JERSEY SHORE THAT ALSO HAPPENS TO BE THE HOME OF THE MTV TRAIN WRECK, MONEY MAKING, STAR-MAKING SHOW “JERSEY SHORE” IS CURRENTLY UNDER SEIGE. 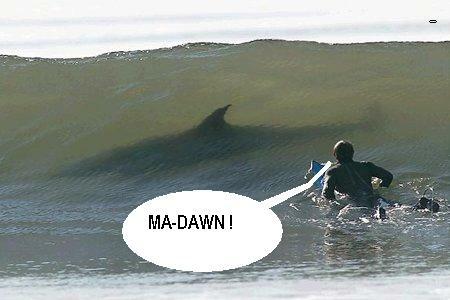 SOME BIG SHARKS ARE PATROLING CLOSE TO THE SHORELINE AND FORCING OFFICIALS TO PROHIBIT SWIMMING. YES, THAT’S THE SITUATION, SO TO SPEAK, AND GUIDOS ALL OVER NEW JERSEY ARE GETTING READY. While Porcorriello — or however I spelled it– thinks that his blinding fists of fury will keep sharks away from his chick, other Guidos and Guidettes are packing heat. 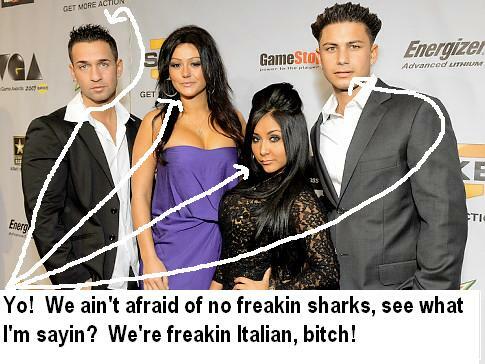 The cast of “Jersey Shore” is currently getting busy to shoot season two and perhaps the troubling sharks won’t bother them. Sharks don’t eat Guidos because spray on tan is a natural repellant, but one can hope, can’t one? HONEYMOONERS STAR JOYCE RANDOLPH ANNOUNCES BID FOR PRESIDENCY IN 2014. Thanks Eibmoz — Keep coming back and tell me what you’d like to read about more often — maybe I skip subjects that others would like to read about.